“The parliament must adopt amendments to the state budget needed to finance our army and also documents needed for cooperation with international financial institutions.[e.g. IMF, World Bank, EBRD]” said PM Yatsenyuk. President Poroshenko has intimated that the resignation of the cabinet has paved the way for a process of meaningful political restructuring: “Society wants a full reset of state authorities,” said Mr Poroshenko. The speaker of the Rada, Mr. Oleksandr Turchynov confirmed that the Ukraine Democratic Alliance for Reform (UDAR) and Svoboda (Freedom) would be invited to propose a candidate to occupy the post of interim Prime Minister. So much for democracy: the leader of a Neo-Nazi formation Oleh Tyahnybok (Image right) will play a key role in the appointment of an interim Prime Minister to replace Mr. Yatsenyuk. In the days following the Ukraine coup d’Etat of February 23, which led to the ousting of the duly elected president, Wall Street and the IMF–in liaison with the US Treasury and the European Commission in Brussels– had already set the stage for the imposition of the IMF’s “strong economic medicine”. “We have no other choice but to accept the IMF offer”. In surrendering to the IMF at the outset of the interim government in March 2014, Yatsenyuk was fully aware that the proposed IMF-World Bank macro-economic reforms would brutally impoverish millions of people, including those who protested in Maidan against the Yanukovitch government. The adoption of the more ruthless components of the IMF’s economic package requiring supportive legislation had been delayed until after the May 25 elections. Meanwhile, the government is cracking down on the Ukraine Communist Party which is now illegal as well as on the Party of Regions, both of which were firmly opposed to the IMF policy reforms. In turn, the Ministry of Defense has raised the issue of direct US military support in the military campaign in Eastern Ukraine, where the Donbass militia have repealed the forces of the Kiev regime. “The United States of America is considering the possibility of granting Ukraine the status of an ally without membership in the North Atlantic Treaty Organization (NATO). … Baldwin said that the American side highly appreciates its cooperation with the Armed Forces of Ukraine and that it is ready to provide comprehensive support to them. He stressed that a draft law on prevention of Russian aggression, adoption of which will allow Ukraine to obtain the status of an ally of the United States without NATO membership, is currently under consideration by the United States government. The granting of the “status of ally outside NATO” would set the stage for the possible deployment of US and NATO forces inside Ukraine in the context of joint military operations with the Ukraine Armed Forces and National Guard. UN ESCWA HQ, Beirut - As the latest Zionist aggression continues to slaughter the civilian population of Gaza, for the fourth time in ten years, hopefully the global community will act to end it. But this is as unlikely as were the last forty years of the “peace process” to bring justice to Palestine. Only persistent Resistance in its countless forms will achieve dignity and Full Return for nearly nine million Palestinians by ending the criminal occupation. The Zionist colonial enterprise still occupying Palestine has had its apologists in Lebanon well before 1948 and there are still plenty today. But the latest ‘lawn mowing’ in Gaza has generated an unusual amount of verbal support for Palestine across the political spectrum here. Even Foreign Minister Jebran Bassil, son-in-law of Michel Aoun of the Free Patriotic Movement (FPM) both politicians known for his anti-Palestinian and anti-Syrian refugee rants, claims he wants “to make a series of contacts with Lebanon’s ambassadors to the United Nations, Switzerland, and Belgium in order to condemn the Israeli aggression.” As reported by Beirut’s As Safir newspaper “he is seeking the preparation of a legal study that will be sent to the concerned international bodies to condemn Israel for its crimes in Gaza.” A bit weak, but welcomed gesture by the ambitious politician. On 7/23/14 the March 14 Al-Mustaqbal (Future Movement) parliamentary bloc organized a well-attended solidarity press conference of MPs in the garden outside of the Economic and Social Commission for Western Asia (ESCWA)’s in Downtown Beirut. Former Lebanese Prime Minister Fuad Siniora declared, “We are here to tell the world that we are standing by Gaza, by every Palestinian, and by occupied Palestine whose land has been ravished. Your wounds are ours and you are fighting on the behalf of all of us. We do not forget the Palestinian people’s right for freedom, dignity and peaceful living,” he said. Others have joined in. Hassah Nasrallah, vowed on 7/19/14 that “Hezbollah will stand with the Palestinian people’s uprising and whose resistance in our heart, willpower, hope and destiny.” On Al Quds day, 7/25/14 Hezbollah will hold a rally and SG Nasrallah will speak again for the need for solidarity for Palestinian refugees and many from Lebanon’s camps with attend because Hezbollah’s words are listened to in Lebanon’s camps as they have been for the last quarter century since the party announced its existence in an “Open Letter” and pledged to seek dignity for all Palestinians everywhere and to improve their daily lives. Iranian Majlis Speaker Ali Larijani vowed that the Islamic Republic will do all in its power to help the Palestinians. The Iranian Foreign Minister and Iran’s embassy in Beirut have been advised, not for the first time, that the most direct, realistic and significant way to help the Palestinian people is to allow those in Lebanon the same elementary civil right to work as they have in Gaza and in every other country. If Iran and its allies are willing to honor their frequently quoted expressions of the late Ayatollah Khomeini and Iran’s current Supreme Leader Ali Khamenei regarding “the sacred cause of Palestine” granting the right to work to Lebanon’s Palestinians would be an historic reaching out to Palestinians who are 90% Sunni, and help heal the tragic deepening Shia-Sunni divide. The help Palestinians most need in Lebanon, where Larijani and his political allies have major political clout is with being allowed to seek employment the same as any other refugee or foreign visitor who arrives. Many Palestinian students in Lebanon are acting in solidarity with their countrymen in Gaza. Among them are 404 who this week, in a noble humanitarian act, donated this semesters tuition grants awarded by Sabra-Shatila Scholarship Program (sssp-leb.com). They made the personal sacrifice by pairing with 404 of their named countrymen killed in Gaza. More than a few have expressed the hope that those offering verbal support to Palestine will use their political power and 90 minutes of Parliaments time to grant Palestinians the means of survival here in Lebanon until they can return to their homes in Palestine by granting them the elementary civil right to work. Gaza is an open-air prison with 1.8 million incarcerated. Lebanon’s camps are also open air prisons whose hapless residents are not allowed to leave the camps to work in dozens of job categories. Charity, it is often said, begins at home. So does Solidarity. So does Resistance. To give meaning and credibility to their encouraging words, the Lebanese and regional politicians through their newspapers and TV channels should pledge today, to end their targeting of Palestinian refugees and target the Zionist occupation of their country by making it legal for camp residents to work. They would thereby also help Palestinian family members in Gaza while helping to build Lebanon’s weak economy. Many, but not all Lebanese politicians play the Palestinian card for personal gain, financial and political, with human rights slogans selectively spewed according to narrow political interests. And then selectively disregard them when their personal interests might benefit. “These words politicians offer us are nice and we thank them. But we have heard them for so many years while the speakers have keep us without dignity and by denying us the right to work. Even the Zionist occupiers let us work. What kind of Resistance are the Lebanese politicians talking about? Does it mean Resistance to our most basic civil right to work and to care for our families? All we ask of Lebanon is to let us work just like every other country allows refugees to work and try to feed their families." The unpleasant fact of the matter is that hollow supportive words from Lebanese and regional politicians do little for Gaza and nothing for their families and countrymen stuck in Lebanon’s refugee camps without the basic human right to work. The Palestinian community in Lebanon among the 4.8 million descendants of the 750,000 ethnically cleansed by Zionist colonials during the 1948 Nakba and more than 300,000 forced from their homes during the 1967 Naksa need help in Lebanon. Such shallow political posturing is increasingly scoffed at and even derided in the camps and among supporters of Palestine. Some of these very same politicians still pat themselves on the back for the fake August 2010 Parliamentary initiative that eliminated a work permit application fee for Palestinians which was never the problem, and kept all the Kafkaesque barriers in place. As a result not ten Palestinian seeking the right to work has benefited during four years since its passive and the Ministry of Labor has not even tried to implement the phone labor law amendment. Lebanon has an opportunity to shed much of its self-imposed disgrace, international opprobrium, help heal the Shia-Sunni wound, improve its economy, lessen the likelihood of an intifada building today in the desperate camps, avoid the increasingly likely international BDS and sanctions campaign to be applied to Lebanon as a consequence of its massive violations of human rights laws. Ninety minutes of Parliaments time to grant the right to work will do more for Gazans and their relatives in Lebanon in terms of Resistance to the occupation of their country than all the well-meaning but hollow words that fade without trace with the wind. The special train carrying refrigerated corpses from the MH17 catastrophe has left the station of Torez, just a few miles from the crash site. People, who died a terrible death onboard the Malaysia Airlines Boeing 777-200, will soon be reunited with their grieving families. They will receive a proper funeral, and will be laid to rest in the Netherlands, Malaysia and several other countries. They are on their way home, at last. The Ukrainian rebels handed over the black boxes to international authorities. The investigation can begin. It hopefully will begin, unobstructed by political maneuvering. Will the Empire allow the investigation to follow its course? The Western propaganda machine is in full gear. The twisting of facts, obscuring of evidence, and maneuvering public opinion all over the world: all this is being done with determination and routinely applied precision. So much is at stake! Increasing cooperation between Russia, Latin America and China could mean the end of Western neo-colonial control of the world. The creation of alternatives to the World Bank can free billions of human beings from market feudalism and its slavery. Powerful news organizations broadcasting from Russia (RT), Venezuela (TeleSur) and Iran (Press TV) are consistently breaking the depressing and nihilistic monopoly of Western propaganda and control of people’s brains all over the world. The more liberating these trends and waves are for the world, the more panic there is in Washington, London and Paris, but also on Wall Street and in the City, as well as in the newsrooms of the corporate media. The West is terrified. Its ‘exceptionalism’, tremendous profits from controlling everything that moves on this planet, the kick of being in charge and holding the whip, all this can disappear if these waves of resistance are not reversed! And the villains are damned Russia and Putin, who is refusing to yield. Putin is despicable, and a real nuisance in the eyes of the Empire, because he is unwilling to sacrifice, or to destroy his own country as Yeltsin had done two decades earlier. The villains are also those bloody Chinese, because they are sticking to their ideals, to socialism the Chinese way, while lifting hundreds of millions of people out of poverty. The other villains are those bastards from Latin America, with their big dreams and humanism, their revolutions and sudden refusal to sacrifice their own people for the well-being of the Western elites. And all of them – these three disobedient parts of the world, three cohorts – are now getting closer and closer together, forging an as yet undefined alliance, but an alliance nevertheless, increasing cooperation, signing treaties, creating alternative organizations, and saying “No!” to the world order. And more countries are looking at all this with hope; more are joining the club of the free. Not absolutely free, but free from Western colonial terror, which is now perhaps the worst kind of terror that exists on this planet (including those horrid derivatives of the regime, implanted all over the planet). To fight these dissident nations openly, to do it on ideological or moral grounds, is impossible. They would most certainly not lose! By now it should be too obvious, it should be too clear who is on the ‘right and wrong sides of history’. Therefore, the “smear” is the only way for the Empire to advance its destructive cause. Or at least it is the most effective way. The good old way of discrediting one’s enemy, was by dragging him through filth, by turning his achievements into failures, his heroic resistance into hideous crimes. The Brits perfected this, ruling their colonies for centuries, by deceit and perverse philosophical concepts. The German Nazis were fairly effective as well. The way it stands, there is nothing good that Russia can do. There is nothing decent about China (it is Communist when it suits Western propaganda or ‘more capitalist than traditionally capitalist countries are’, when it fits the bill). Venezuela with its direct democracy is dictatorial. And so on. And now the plane… The second Malaysian Boeing 777 lost in one single year… Both belonged to one of the best airlines on earth, with a great maintenance record for its equipment! Strange, very strange… But Russia is certainly to blame. Because the President of the United States said so, because the British PM said so… No proof is needed. The Western public is extremely obedient. Now the bodies are going! From a small Torez station, they are going home, wrapped in bags. They are victims of something that many decent people all over the world are even afraid to formulate in their minds. The area of Eastern Ukraine that they – the corpses – are now leaving, is full of local victims, too – those civilian victims of ethnic cleansing, whose only fault is that their maternal tongue happened to be Russian, or that they do not or cannot live in a country run by the pro-Western fascist dictatorship of the ‘Chocolate King’, Poroshenko, and his gangsters. Now civilians are dying, every day. That does not bother the Western regime. Killing the rebels, their families and neighbors, is encouraged. Burning people in Odessa, burning them alive, is not even criticized in the lackey corporate media. The entire debate and coverage of events has become grotesque and sick. More then 100,000 people have recently crossed into Russia, seeking refuge from Ukrainian bombers and rockets, or perhaps more, most likely much more. Russian lives do not count. Asian lives do not count. African lives do not count. Middle Eastern lives do not count. The lives of Latin Americans do not count. That is why the West so freely and without hesitation has murdered tens of millions of ‘unpeople’, for decades and centuries. The formula is simple: Dutch tourists do count. Ukrainian villagers don’t. It was quite similar during Nazi control of Europe. “The US TV networks —the West’s Ministry of Truth organs—and other media have been blabbering almost nonstop for the past few hours about the Malaysian airliner down in Ukraine. In the early reports on CBS, ABC, etc., I perceive a marked tendency to suggest “Russia or her proxies did it”, in this case also involving the “Pro-Russia separatists” in East Ukraine, who supposedly “have been shooting at planes” (the implication is indiscriminately) in their struggle against Kiev’s all-out military offensive. As you probably agree, this is either an outright blatant provocation by the West, or a direct result of Washington’s criminal policies in Ukraine. It’s easy to determine several scenarios in varying degrees of plausibility and culpability. While it’s plausible the plane was shot down by Eastern Ukraine separatists, it’s also obvious they (and Russia) have little to gain from such an act. So at worst, it can be argued it was simply an error on their part. Indeed, if the plane was shot down by a missile, it could have been fired accidentally by the East Ukraine rebels—perfectly understandable given the horrible pounding they’ve been taking by Kiev’s air force, etc. Welcome to the new, even higher stakes Cold War, courtesy of the usual bastards in Washington, and their accomplices around the world. All this was happening while I was working in Cambodia, trying to counter another fully perverse narrative manufactured by the West in this tortured country, several decades ago. “There is a tendency in the 21st century World of 24-hour rolling news coverage to overemphasize and dramatize individual incidents in a conflict, subjecting them to intense coverage, while at the same time failing to analyze the underlying causes and patterns of conflict. The task of analyses is to focus on the “signal”, not the “noise”, but most modern media do the opposite. It’s also clearly true that powerful global interests seek to control the narrative by staging events to drown out the signal with noise. Some opponents of this strategy seek to create their own “noise”, trying to undermine the dominant narrative. In many instances it is justified, but a focus on the noise rather than signal can be counterproductive. For example, I believe the overwhelming evidence of what happened on 9/11 is that men associated with Al Qaeda flew planes into the World Trade Center and the Pentagon. This was then exploited by the United States to justify a disastrous “war on terror” in the Muslim world. “Without any doubt, the tragedy of the Malaysian airliner has become the most significant political event of the last few years. The tragic death of innocent people shook public opinion in Ukraine and in the entire world. Unfortunately, the circumstances of the tragedy and the information related to it, offers more questions than answers. First, and the most important question, is how did a passenger airliner happen to be in the epicenter of the military conflict? In all those days leading to the tragedy, the mass media was carrying stories about attempts by the insurgents (both successful and unsuccessful attempts) to down airplanes belonging to the Ukrainian military. Earlier it was announced that the airspace was declared closed for civilian aviation. Besides, MH17 deviated significantly from its usual flight path; routinely it was flying more to the south. Answers to these questions should be given through an international investigation. The second important question is based on the claim by the Ukrainian security services, related to some “intercepted communication of the terrorists”, that the ‘terrorists’ were the ones who downed the plane. This communication appears to be a clear fabrication, fake, but were it to be genuine, it would provoke even more questions towards the Ukrainian security services: would it mean that they were able to monitor the communications of their adversaries, were familiar with their plans, but did nothing to prevent the tragedy? The most terrible thing is that the tragedy of innocent people who lost their lives is being used by Ukrainian mass media as some sort of justification for the loss of lives of the civilian population in Donbas. The onslaught of the Government forces began with renewed zeal, not caring at all, anymore, about the losses among the armed forces or civilian population. “The downing of the Malaysian airliner was either an accident by the Kiev forces or the anti-fascist forces of the Donetsk Republic, in each instance targeting the plane because they thought that it was a military and therefore a legitimate target, or it was a deliberate attack on a known civilian aircraft. If it was deliberate then it is a case of mass murder and a war crime since it took place in the midst of hostilities. I wouldn’t call it an act of terrorism as some have said as an act of terrorism is designed to create fear and panic in a population. Clearly those who downed the plane had other motives than creating fear and panic among civilians. Many writers over the past few days have commented that neither the DPR forces nor Russia had either the equipment in place to hit neither the plane nor the motive to deliberately shoot it down. But there is strong circumstantial evidence that the forces of the Kiev regime had the means, the opportunity and the motive. They had the equipment and engaged in very suspicious actions; they had BUK anti-aircraft systems in place for unknown reasons since the DPR forces have no aircraft, the Ukraine Air Traffic Control ordered the plane’s crew to divert from the regular more southerly route to go north over the combat zone, a Ukraine jet fighter was recorded by Russian radar climbing rapidly towards it just before it went down, and, within minutes of the crash, it was the Kiev regime and its masters in Washington and London who cried loudly that it was the DPR and Russians who were to blame without a shred of evidence to support the claim. And now we know that the Ukraine SBU immediately seized the ATC radar tapes and do not appear to have handed them over to international investigators. Kiev and Washington also had the motive: to smear Russia and the anti-fascist forces and to provoke the EU to abandon its political and economic relations with Russia. It does not take a Hercule Poirot or Sherlock Holmes to conclude the most likely suspects are in Kiev and Washington not in Donetsk and Moscow. President Putin has insisted on an objective international investigation since the news broke while President Obama and his minions in Kiev have done nothing but call for the head of Putin. History shows that President Putin has insisted on adherence to international law and civilized behavior consistently throughout his terms in office. His integrity is unquestioned, whereas President Obama has been consistent in his calls for war, war and more war in every region of the globe and insists that the Americans are “exceptional” and above the law and judgment. The presentation of logical arguments and proof, by Moscow, by the rebels, and even by some dissidents inside the Western regime, has not changed the dogged and extremist position of the Empire. But why should it, really, if the entire scenario had been, most likely, manufactured (or at least manipulated) by the neo-con mafia in Washington and by their counterparts in European capitals? “Russia’s Defense Ministry on Monday presented its first detailed account of the final moments of Malaysia Airlines Flight 17, saying Russian radar had spotted a second aircraft in the vicinity shortly before the crash and that satellite imagery showed Ukraine had moved missile systems into the area before the incident. At a news conference, air force chief Igor Makushev didn’t say who the ministry thought had fired the missile that apparently brought down the airliner on Thursday. But there was much more to it – proof after proof painstakingly put together by the Ministry of Foreign Affairs of the Russian Federation. And one is only left to wonder how many ‘objective’ and ‘well-informed’ European and US citizens ever read these accounts. It is becoming clear and obvious, that even at the height of the so called Cold-War, citizens of the Soviet Union, even countries like Romania, were much better informed and knew more about the lines of thought of their adversaries, than the arrogant and thoroughly brainwashed Westerners now know about the points made by the people in the countries designated as their enemies. The Wall Street Journal was referring to what occurred on July 21, 2014, at a Special Briefing by the Ministry of Defense of the Russian Federation on the crash of the Malaysian Boeing 777 in Ukrainian air space, the speech was given by the Deputy Chief of the General Staff of the Armed Forces of the Russian Federation, Lieutenant-General A.V. Kartapolov. For those who are interested in what Russia has to say, these briefings are indispensable. I worked for several hours on improving the original translation, while trying to keep the original tone in which this was presented. After the Malaysia Airlines Boeing-777 accident on July 17, studying the international flight-plan for, Amsterdam – Kuala Lumpur, we can find a quantity of conflicting information. In this case, the Russian Federation Ministry of Defense considers it necessary to submit the information which is at the General Staff’s disposal. On the scheme you can see the international flight-path. The Boeing-777 was supposed to fly on this flight-path. Draw your attention to the fact that the aircraft was flying inside the specified air corridor to Donetsk, but then it deviated north from the route. Meanwhile the maximum distance from the left border of the air corridor was 14 kilometers. Then we can see that the Boeing-777 turned back to the borders of the specified air corridor. Nevertheless, the Malaysian aircrew didn’t perform the maneuver successfully. At 17.20 the aircraft began registering a rate reduction, at 17.23 the aircraft’s point blinked off on the radar. Why did the aircraft cross the border of the air corridor? Was it a navigation mistake, or the aircrew following the Dnepropetrovsk ground control orders? We will find out the answers after the decoding of the “black boxes” and communications. According to our information on the day of the accident, the Ukrainian Armed Forces deployed 3 to 4 artillery batteries of Buk-M1 missile systems not far from Donetsk. The system can hit targets at a distance of up to 35 kilometers, and at an altitude, up to 22 kilometers. Why did the Ukrainian Armed Forces deploy these air defense units in the Donetsk region? As we know militants don’t have any aircraft. Then the photos of the Buk are shown, near Luhansk and Donetsk. The first three photos are dated July 14, 2014. There are photos from that day to the day of the accident: launchers, radar, all belonging to the Ukrainian military. “I want to expose the airspace situation in the Donetsk area that day. In the picture you can see the information of the objective air traffic control between 17.10 to 17.30 Moscow time. Flight from Amsterdam to Kuala Lumpur… Beside it, the Russian system for air traffic control detected a Ukrainian Air Force aircraft, supposedly a Su-25, moving upwards towards the Malaysian Boeing-777. The distance between two aircraft was 3-5 kilometers. The Su-25 can gain an altitude of 10,000 meters in a short time. It is armed with an air-to-air missile R-60, which is able to lock-on and destroy a target at a distance of 12 kilometers, and destroy it definitely at a distance of 5 kilometers. What was the mission of the combat aircraft, in the flight-path of civilian aircraft, almost at the same time and same altitude with the civilian craft? We want to have this question answered. Management System. The video presents the air control information on the airspace situation in the region of Donetsk in the period from 17.19 P.M. to 17.25P.M., Moscow time, on July 17, 2014. In the upper left corner there is a Boeing-772 mark, as it was following the route from Copenhagen to Singapore. Under this dot, there is another aircraft – it is marked as Boeing-777, which is on its way from Amsterdam to Kuala Lumpur. And on its right there is a Boeing-778 mark making its way from Delhi to Birmingham. All these three aircraft have been steadily monitored by the three radar stations of the air traffic control of the Ministry of Defense of the Russian Federation. The Boeing-777 is moving towards the Russian Federation state boundary, and is to cross it at the point of «TONAK». An air traffic control officer has been controlling the aircraft flight and keeps on enquiring for its flight variables to compare them with the given ones. At 17.20 P.M. at a distance of 51 kilometers from the Russian Federation state boundary and the azimuth of 3000 (degrees), the aircraft started to lose its speed inexplicably, which is to be seen quite distinctively on the table of the aircraft characteristics. At 17.21.35 (seconds) P.M. with the aircraft at a speed of 200 km/h, at the point of the Boeing crash, there is a new mark of an aircraft to be seen. The radar stations of Ust-Donetsk and Butirinskoe, during the 4 minute period, steadily monitored the aircraft. The Air Traffic Control officer, having enquired for the characteristics of newly appeared aircraft but couldn’t possibly get them, because it is in all likelihood that the aircraft had no secondary deduction system mounted on it, which is typical of military aircraft. The early detection of this aircraft appeared to be quite impossible because those radars work in a standby mode and usually perform the air situation control. Detection possibilities at the given distance are over 5000 m altitude. The detection of the aircraft turned out to be possible as soon as the aircraft ascended. The further aircraft flight variables changed. It was now flying in the area of the Boeing crash and was monitoring the situation. Earlier the Ukrainian officials reported that on the day of the Boeing-777 accident, there were no military aircraft flying in the region. So, as you can see, it does not appear to be true. …We also have some questions for our US partners. According to the statement of the US representatives, they have some pictures from space supporting that the militants launched the missile. But nobody has seen these pictures. According to our records from 17:06 till 17:21 Moscow time on the July 17 over the Southeastern territory of Ukraine, a US space satellite flew overhead. This is a special device of the experimental space system designed to detect and track various missile launches. If the US party has photos made by the satellite, please let us ask them to show them to world community for further investigation. Now why on earth should we not believe this presentation, backed by facts, images and concrete analyses? And why should we believe people like the current President of the United States, who openly bragged about US ‘exceptionalism’, at the military academy, which has been responsible for producing countless mass murderers? And for the sake of objectivity, why would we not listen to the Russians, before imposing sanctions on them, for something that we are, most likely, responsible for, ourselves? And although it is most likely that the pro-Western Ukrainian military shot down the plane, even if it were to be the other side that did it, the entire conflict began with the EU and the US destabilizing Ukraine, overthrowing the legitimate government, and igniting the war. Angry Dutch families of the victims should stop pointing fingers at Russia. Instead they should go to Brussels and Washington to express their wrath and to demand justice. And what about Malaysia and Indonesia? Indonesia lost 12 people on that ill-fated flight. Most of the Southeast Asian countries are historically “client” states of the West, with hardly any independent, non-corporate media. Indonesia has been exactly that since the 1965 ‘events’. Malaysia, pushing for an independent course under Dr. Mahathir’s rule, is presently being lured by the US, which is trying to establish military bases there, or to at least gain access to existing Malaysian ones. Suddenly, a great amount of US funding has been unleashed, to win over Malaysian intellectuals, some of the most shamefully subservient in the region. Several have already began departing for conferences, cultural exchanges and writer’s retreats, to destinations all over the United States, all expenses paid. In Kuala Lumpur, there was deadly silence after the downing of MH17. Not one writer or filmmaker that I know and contacted wanted to go on record. One mistaken word and the entire rosy dream of Western ‘funding’ would go up in flames. Only the official anti-Russian narrative was available. In Indonesia, theories vary. Some are far, remote from the war in Ukraine. New sanctions are being leveled against Russia. “Cold Warriors” in Canada, Australia, UK and US are back in their saddles, like Major Kong in the unforgettable film, “Dr. Strangelove, or: How I Learned to Stop Worrying and Love the Bomb”, they are ready to cover their skulls with cowboy hats, and stick A-bombs between their legs. Time to ‘go and bomb the Russkies’. Arabs are not tough enough adversaries, and most of the Muslim world is now in ruins anyway, thanks to the ‘War on… ehm… terror’. After the MH17 tragedy and after the way it has been handled by the Western mass media, there is no doubt that we are back to the Cold War again. It is not just a war against Russia. The war is reflected in the arms race that is being accelerated by the US in Asia, from the revolting, racist anti-Chinese propaganda, and from the attempts to overthrow our socialist governments in Latin America. We should never forget that Western imperialism murdered tens of millions of innocent people all over the world, after the Nagasaki ‘A-bomb’ and the official end of the WWII: all those crimes and horror to satisfy its unbridled obsession with controlling the world. Tens of millions of lives already lost. Why should they spare some 298 of those on MH17? Once again, Canada’s Foreign Minister John Baird advances the cause of U.S./Western hegemony, using the same old, same old arguments utilized by western governments and their media ‘presstitutes’ (as labelled by Paul Craig Roberts). Gaza is once again under attack by Israel, as it has been many times over the past seventy years from the 1947 nakba onward. Its current population of about 1.5 million is contained within a concentration zone of about 360 km2 . The densely populated area is totally controlled by Israel with a highly militarized fence on the land perimeter, and an ongoing naval blockade of the Mediterranean shore. The area’s citizens are mainly refugees from a series of wars, in particular the nakba and the 1967 war, and live in highly constrained conditions. Those conditions include severe inhumane limitations on the materials and goods that can be imported into the territory, and on those products that could be exported (mainly farm produce). A semi-official policy of the Israeli government is to keep the population living on starvation ration, as indicated by Dov Weisglass, advisor to Ehud Olmert, “The idea,” he said, “is to put the Palestinians on a diet, but not to make them die of hunger.” In addition, energy sources are limited, fuel supplies are limited, electricity is restricted, health and medical supplies are restricted. Egypt does not help with this. Egypt has controlled the Rafah crossing for the benefit of Israel, not for the trade that could occur between the two countries. Under Mubarak, Egypt allowed a certain degree of exchange, mainly by allowing the Palestinians to tunnel under the border fence. With the election of the Muslim Brotherhood, hope increased for more openness, but that never occurred. When al-Sisi stage his coup d’etat and took control, the border was closed even further. To think that Egypt could act as “an honest broker” as per Mr. Baird’s comments on his teleconference this morning is absurd (CBC News Network, Monday, July 21) . It is also absurd to support the supposed ceasefire arrangement between Israel and Hamas as Egypt did not talk to Hamas but came up with their own solutions. As a puppet client of both the U.S. and Israel, and hostile to Islam, Egypt has no credibility as any kind of negotiator for the region, as per Baird’s thinking that “Egypt is uniquely qualified to broker a ceasefire.” What qualifications might those be Mr. Baird? Further, Mr. Baird indicates that “only one group is entirely responsible for this,” being Hamas. From what is indicated above, this is obviously not the case. From its inception, and recognized by early Zionists as well as relatively modern Zionists, including Ben Gurion, the big problem with Eretz Israel was and is the demographic problem. It has been a tenet of Zionist belief and action that the ethnic cleansing of Eretz Israel has been, is, and will be an ongoing action that operates at various speeds according to domestic and global situations. The current distraction in Ukraine is an opportune time to load the guns and missiles and attack the Palestinians once again, if not for immediate expulsion, then at least for the long term goal of ridding Israel of any Arab/Palestinian presence. Which leaves an interesting tie-in to the Ukraine, as Baird indicated that for the current situation with the MH17, the “Kremlin may not have pulled the trigger but it loaded the gun.” That is a highly contorted perception of what may have occurred, but bringing the idea back to Israel, “it is the U.S. and its allies that loaded the gun, but Israel pulled the trigger.” Effectively, Canada and the U.S. and other European allies within NATO are complicit in the Israeli war crimes against civilians and children, not to mention the illegality of the whole Gaza concentration imprisonment in the first case. Baird and the presstitutes paint the picture of two equal combatants fighting it out for control of the Gaza Strip. In reality, it is an asymmetric battle, with Israel having the overwhelming preponderance of force with their own and U.S./NATO supplied materials and their ever present controls of the total Gaza zone on land, sea, and in the air. Israel is a colonial-settler society, highly militarized, and very consistent with their fear of the demographic threat of the Palestinian population. Israel has created a zone in which all persons are enemy combatants and thus are able to be killed regardless of whether they are women or children or non-combatants. It simplifies their thinking and allows them to retain the lie of their false moral superiority. Rather than, as in Baird’s perception, “Hamas can end this right now” by not fighting the Israelis with ineffective rockets and small arms, the corollary is also true: Israel can end this right now. Israel, at a minimum, should withdraw from Gaza and then proceed with actions that will increase commercial activity, and that will allow full medical, educational, and infrasture support for the area. So let’s start at the beginning. According to Baird, the beginning was when Russia took over Crimea. That was certainly the beginning for the western media blitz supporting the newly installed nazi based coup d’etat in Kiev. However, the current ‘beginning’ was when Victoria “F**K the EU” Nuland, assistant secretary of state for the US, essentially appointed Artseniy Yatsenyuk as Prime Minister of the Ukraine. The real beginnings go back much further in history, with many different starting points. But let’s give World War II as the dividing line between modern history and other history (without calling it ‘ancient’ history’) for it is at that time that the current mess was set up. After WW II, Kruschev, in a misguided political move, gave Crimea and the eastern provinces of Donetsk and Luhansk to Ukraine for vague reasons of political solidarity. The population, language, culture, religion, and politics have, before and after, have retained strong ties with Russia, and are a majority of the population demographics. Crimea had a legally established Russian military presence well before any of the current problems originated. They did not invade Crimea and only assumed control of the province after a vote that in most modern terms, and especially vis a vis Iraq, Afghanistan, and Egypt, would be considered highly democratic. Putin has wisely stayed out of Eastern Ukraine, de-escalating the situation by withdrawing his forces from the border region. 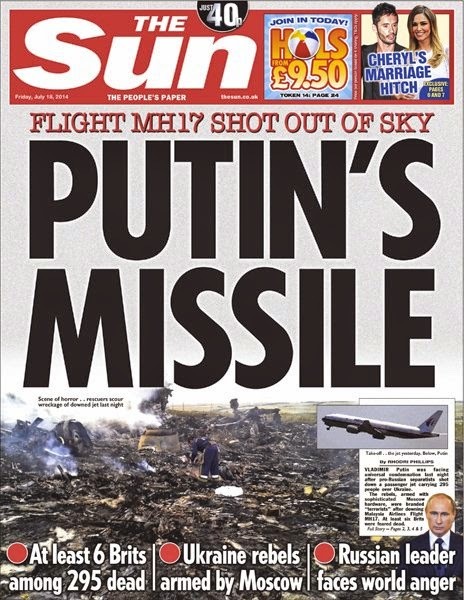 He is intelligent enough to know that any action such as the MH17 kill would be utterly foolish in geopolitical terms. That is where the western 'presstitute' media swallows U.S. ejaculations over the issue without critical thought. Baird’s sources of information are “social media site” - well known for out of context or historically false postings - that reported “two other planes taken down.” Well in reality there have been more than two other planes taken down, but, yes, it is a war zone, and the other planes were Kiev based Ukrainian planes flying at low altitude. It is always surprising that the U.S. seems to know immediately what happened, who did it, how they did it, and even why they did it. All part of the media blitz that western media mostly ingests and regurgitates without question. His reference was that “sanctions worked in Burma and South Africa” which is at best partially true. Sanctions certainly drew awareness to the conditions in these countries, but it was ultimately a political decision based on the need to look good for domestic purposes, as U.S. corporations and government liaisons continued up to the end of apartheid. For that matter in South Africa, apartheid may not have ended had the resistance not given way to the demands of the white powers to give up their ideals to nationalize the corporations and distribute the wealth to its citizens, but rather to let the corporations continue to harvest the wealth for the benefit of the whites and the few black oligarchs that were created in order to demonstrate the new ‘equality’. Okay, a bit of a diversion, but back to the Ukraine and the effect of sanctions on Russia. Mostly, if reading the financial blogs on line gives real indicators, as they tend to do, getting their information from mainstream sources, the effects have been negligible on Russia. Sort of - it has pushed Russia further into the BRICS alliance and the general move away from US$ hegemony, probably the worst possible outcome for the U.S. short of nuclear war. Another effect is the recently faltering German economy. Now that may not be a direct effect and could be largely apportioned to the general misery of the EU economy in the first place, but Germany has large ties with Russia and China, and if they accept U.S. demanded sanctions, they will be hurting their own economies as much if not more relatively than that of Russia. Another unannounced effect has been the silent support provided by China for the Russian position. China is also under U.S. threat, and has already pronounced that the era of US$ hegemony must end. Sanction against Russia only strengthen this position as China can see what is in store for itself. Not only does China silently support Russia, the other BRICS and many other formerly third world nations, developing nations, do as well, as witnessed by the very recent establishment of a new ‘world’ bank supported by the BRICS in order to avoid using the dollar. The majority of the world’s population is quite happy to see U.S. power diminished in ineffectiveness and possibly future hopelessness as the US$ fades into zero value, and U.S. political machinations are rebuffed by the BRICS. That may seem like a diversion, but it is central to what is happening in the Ukraine. Little is known about the crash of MH17 in spite of Baird’s citing of ‘knowledge’ about it, which he really does nto cite, and does not provide sources other than his foolish ‘social media’ comment. Social media may be widespread, but it is not well informed, and can only provide superficial out of context information, or as is usual with U.S. interests, false information. For Baird to ‘man up’ as has been requested of Putin, Baird should lead a contingent of the Canadian military to the Ukraine in order to fight alongside the Kiev forces in Eastern Ukraine. NATO need not be involved, this would be a purely bi-partisan act of assistance. A large portion of those Kiev forces are mercenaries hired by the oligarchs in Ukraine determined to preserve their power and control within the region, good company for Canadian forces under Baird. Essentially Canada’s position is one of a reliable sycophantic minion attempting to front run the U.S. in its taking a tough stand against Russia. It is an idiotic position, a retard to the era of Cold War thinking in an era of internationalized economics. The end result may well be a new world order where the economic power is fully in the hands of the BRICS and ‘fortress’ North America is an isolated island with increasing disparities between rich and poor, and omnipresent surveillance and control of the population. Sounds dramatic, but that is currently what is slowly taking place. It is simply a lie that Israel's slaughter in Gaza is a response to an "unprovoked attack" by Hamas. Not only is it a lie, it is a transparent, brazen lie, whose falsehood is glaringly apparent to anyone who had given even a cursory look at coverage of the Israeli government's response to the murder of three Israeli teenagers in June. At that time, we were told in many news reports about an Israeli "crackdown" in Gaza, including mass arrests, military operations and, finally, the killing of six Hamas members. It was after these operations and these killings -- which were clear breaches of a ceasefire which Hamas had been honoring for 19 months -- that Hamas began its retaliation against Israel's unprovoked attacks. These are all undisputed facts. The narrative that dominates the Washington media and political discourse -- "plucky Israel attacked without motive by demonic foes" -- is, again, an obvious lie. But that has not stopped it from being repeated endlessly, all across the political spectrum and in every form of media, day after day after day. It is impossible that Barack Obama does not know these undisputed facts. Standing at the apex of history's most all-pervasive intelligence system -- and receiving daily digests of news reports on volatile areas like the Middle East -- he of all people knows that the Hamas rocket fire was a response to an Israeli military action, an Israeli violation of a long ceasefire. It is also impossible that a majority, if not all, of the 100 U.S. Senators who voted to endorse the Israeli slaughter in Gaza -- including stalwart "progressives" like Al Franken and "socialist" Bernie Sanders -- did not know the truth when they cast their ballots. It is impossible that the editors and reporters of the nation's leading media organizations do not know these facts -- which they themselves reported only a few weeks ago. Yet day after day after day, from the commanding heights of our "culture" (if the debased goon show of our public discourse deserves such a word), the Big Lie thunders forth. What's more, Obama is putting his money (or rather, our money) where his mendacious mouth is, tacking $225 million for Israel's "Iron Dome" missile defense system into a bill ostensibly meant to deal with the influx of child immigrants. Obama and the Senate Democrats are making political pawns out of these children -- most of whom are fleeing Central American hellholes created in no small part by decades of bipartisan military and political backing for repressive oligarchs. (Including, of course, Obama's support for an oligarch-militarist "regime change" coup in Honduras early in his presidency.) With the new money for Israel's military, the Democrats hope to sucker the Republicans into voting for the emergency immigration bill (from which they cut $1 billion -- hey, you don't want to coddle those kids! ), or else put them in a political bind if the immigrant-hating GOP votes against the bill: "You aren't supporting plucky little Israel!" A very cynical ploy, yes, but no matter: even if it fails and the children are left to languish, some other way will be found to get the money to Israel and, most importantly, show the world that America fully supports the massacre -- more than 800 Palestinians killed so far, including whole families, refugees at a UN shelter, patients in hospitals and other prime military targets. Eight hundred dead -- and Obama gives the IDF a $225 million bounty. Maybe when the death count reaches a thousand, he'll buy Netanyahu a pony or something. Israel’s military operations in the West Bank following the abduction and killing of three Israeli teenagers have amounted to collective punishment. The military operations included unlawful use of force, arbitrary arrests, and illegal home demolitions. ... Giving more details, several of the weekly reports from the Palestine Center for Human Rights (PCHR) indicate that Israeli forces and settlers killed 11 Palestinians and wounded 51 during 369 incursions into the West Bank between June 12 and July 2 and that Israeli forces raided hundreds of houses on the West Bank each week. 110 bombing raids, a military incursion, 17 killings, mass arrests -- all before Hamas fired a single rocket. This is what Obama -- and every single member of the United States Senate -- call an "unprovoked attack." They say it with a straight face -- nay, with long, somber, pious faces -- but they know it's a lie. But let us imagine, just for a moment, that their deceitful narrative was true. What if Hamas just woke up one fine, clear peaceful morning and said, "Hey, let's start firing missiles at Israel, fellas! Won't that be a hoot?" The fact is that even in that scenario, it would not be an "unprovoked attack," but a legitimate act of self-defense. Israel has imprisoned the people of Gaza in a stateless limbo while carefully controlling almost every aspect of their lives, including what medicines they can have, what manufacturing and building materials they are allowed and even, at times, how much food they are allowed to eat to keep the population weakened but just above malnutrition levels. This brutal regimen in daily life is of course punctuated with regular night raids, bombings, kidnappings, “disappearings” and almost weekly civilians deaths at the hands of Israeli overseers. This has gone on year after year. Eban said Israel was justified in retaliating with military force when Egypt had blockaded a port for a few weeks. How much more justified would the Palestinians be in retaliating against a total blockade -- by land, sea and air -- that has lasted almost eight years? I don't agree with lobbing missiles into cities. I believe it's wrong. But I also realize that I have the great luxury of pondering these moral and legal and philosophical questions at my leisure, in comfort and safety. I haven't seen my family half-starved, my children's growth stunted, my friends and relatives blown to bits. I haven't been trapped in stateless limbo, with no passport, no freedom, no opportunity, under threat of violent death or arbitrary arrest every moment of my life. I don't know what I would do if that was my reality. I don't know what I'd do if I saw my loved ones suffer that way, year after year. I might somehow hold on to the ideal of non-violent resistance -- or I very well might not. But I do know that by the terms of the world's great and good -- who speak portentously of the "laws of war" and analyze in great detail the "justifications" for violent conflict -- the Palestinians have a right to resist the "slow strangulation" of the blockade ... and the "shot in the head" (and the missile in the crib) that they are now being subjected to. By Abba Eban's own reasoning, from the very first day of the Israeli blockade of Gaza, "the question who started the war or who fired the first shot became momentously irrelevant." Note: Updated 25/7 to reflect increase in the death count. Israel’s assault on the Gaza Strip has triggered the largest West Bank protest in years, with more than 15,000 people marching Thursday from Ramallah toward Jerusalem. Two Palestinians were killed and more than 200 were wounded when Israeli soldiers fired live ammunition. We go to the West Bank to speak with journalist Amira Hass, Ha’aretz correspondent for the occupied Palestinian territories. "There were whole families, and women and men, traditional and modern, and middle-class and workers. Everybody went very determined to show that this is enough," Hass says. Although weather data online is all but unavailable for the area of Donetsk, Ukraine for July 17th, conditions are evident by numerous videos depicting the crash and crash site in the aftermath - it was cloudy and overcast, with more visibility above the cloud canopy. This factor is important because at the normal cruising altitude of 33,000 feet (10,000 meters), the airliner would not be visible from the ground in the rebel-held area where Washington is insisting a SAM missile was launched. Why Kiev air traffic controllers order MH17 to suddenly drop its altitude, from 35,000 feet to 33,000 feet, just before the plane’s demise is unknown for sure, but it would have been near impossible for the alleged rebel gunman occupying this relatively small rebel-held patch of land to make a visual sighting of MH17 and acquire the target during the 1-2 minute window they would have had (assuming they were even in possession of the BUK missile system). Much has been made by the US and its media of MH17 being shot down and crashing in “the rebel-held area”, but few are aware of just how small the said area actually is. The Ukrainian military had already isolated the rebel area which Kiev and Washington insist a rebel-controlled BUK SAM missile battery had fired on the passenger jet. The actual size of this rebel-held patch is only 40-50 miles wide, with MH17 approaching on a southeastern route over Horlivka, the frontline of this rebel-held zone, towards Snezhnoye (Snizhne). Cruising at 58o mph (933 kmph), MH17 would have only been visible for a very short time – just over 1 minute (if Kiev had not ordered MH17 to alter its course and altitude then it would not have been visible at all), from the vantage point of the alleged rebel firing position. According the Jane’s Defense, the alleged cluprit – an SA-11 (NATO code name) or ‘BUK’ missile system, requires 5 minutes set-up active targeting, followed by an additional 22 seconds ‘reaction time’ for target acquisition and firing. As the MH17 was only visible for 70 seconds above this rebel-held area surrounding Grabovo, unless the alleged rebel firing position was specifically tracking MH17 long before it entered the rebel-held airspace and could distinguish it from other military civilian aircraft also in the general vicinity, Washington’s theory and Kiev’s accusation – that rebels shot down this aircraft becomes even weaker. Thirdly, Kiev is going broke trying to fund what appears to be an ethnic cleansing campaign in eastern Ukraine. Sources from the Parliamentary budget office in Kiev now confirm that as of August 1st, Kiev can’t pay its military (who are, in fact, waging war against its own people and calingl it ‘anti-terror operations). against Ukraine. He has since reversed this position. Obviously under great pressure to show strength in the face of a complete collapse in confidence, Harf (photo, left) could be seen stuttering and twitching nervously as difficult questions were raised by members of the media. 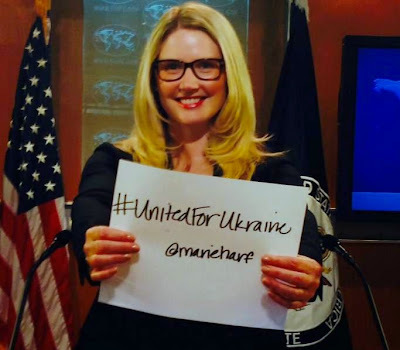 In one of the biggest flops in State Dept. history, Harf appeared so desperate to shed any further questions on ‘social media evidence’, that she opted for a fatal gaff - stating on record that “US intelligence officials have authenticated the audio”. Unless she means they’ve authenticated these as fake, this statement may come back to haunt US officials. Many are now calling it a bold-faced lie, designed to cover-up the mishandling and over-politicization of posts found on social media, shamelessly used by Washington to promote a war agenda. Most certainly, this blueprint by US intelligence is mirrored today in 2014, as the US and its NATO member allies (and media assets in tow) using totally synchronized messaging – dominated by wild speculation, hyperbole and hysteria characterizing the rebels in the east of Ukraine as terrorists, Russia as the enemy, and President Vladimir Putin as ‘the personification of evil’ for American and British media consumers.All we need now is the truth.